Aberlour Children’s Charity will be hosting a 5-a-side charity tournament at Soccerworld in Glasgow on Saturday 4th August from 12pm-4pm (approx). Earlier this year the charity launched it ‘Clock is ticking’ campaign asking people to #spendanhour fundraising for the charity which works to get support to Scotland’s vulnerable children, before it’s too late. 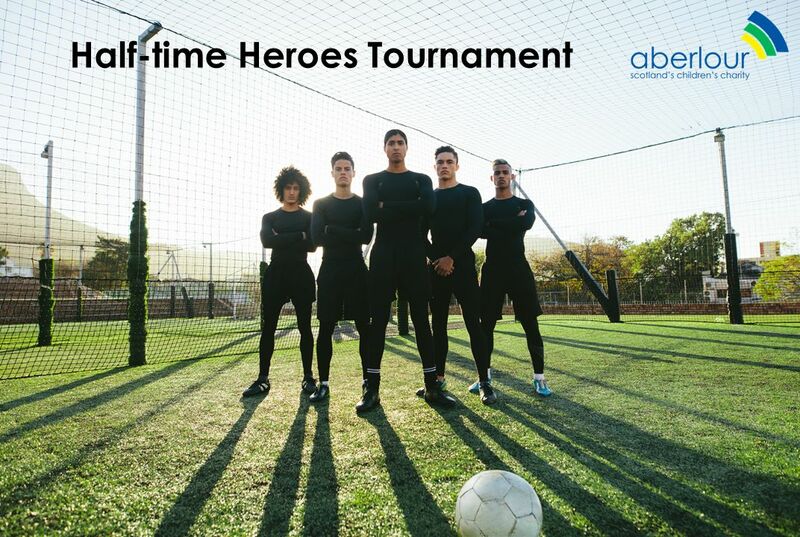 Teams signing up for the Half-Time Heroes tournament can look forward to a full day of footballing fun, with a guaranteed minimum of five games. A buffet lunch and family entertainment will be provided, and there be live commentary on the final match, followed by a trophy presentation. To register your team email Nadia Whitmore at fundraising@aberlour.org.uk. Teams must consist of 5 players plus 2 rolling subs. Registration is £50 per team with a suggested minimum fundraised amount of £200 per team. Please note the minimum age for participants is 16 years. Intandem – A national mentoring program funded by the Scottish Government and managed by Inspiring Scotland. The service brings together vulnerable young people with a mentor to build a consistent and trusting relationship, and improve their chances in life. Aberlour Youthpoint, Glasgow – This service helps children and young people living in areas where there can be high levels of deprivation, crime and drug use. Many are at risk of using drugs and alcohol, committing crimes and coming to harm through violent gang culture. A simple intervention from a positive adult role model, taking in interest in them and their welfare, can often be all it takes to bring about positive changes in their lives. Aberlour Guardianship Service – This service supports refugee children and young people, and victims of trafficking who arrive in Scotland alone. The service helps unaccompanied asylum-seeking and trafficked children and young people. All of the refugee children and victims of trafficking that we support, have arrived in the country without their parents.